Since it will probably never get warmer in the Northeastern US, I may find myself wearing this top all summer. The pattern is a fairly new Vogue pattern, 1115. This pattern appeals to me for a couple of reasons. The shoulder/sleeve treatment is stunning, and I really like pullover tops as outerwear. I think it’s nice not to have closures at the center front. Also, there is interesting seaming overall. 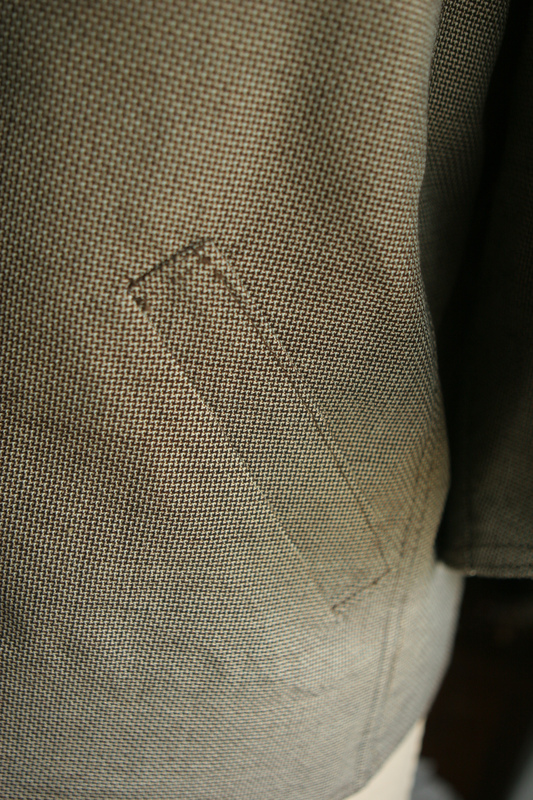 The fabric is a wool suiting, underlined with silk charmeuse. The wool came from michaelsfabrics.com, and the silk came from London Textiles. There’s kind of a strangely-placed zipper. After I put it in, I realized is not strictly necessary for me to get the top on and off. However, I may end up glad that it’s there anyway, as it cannot help but make it easier to put on and take off. 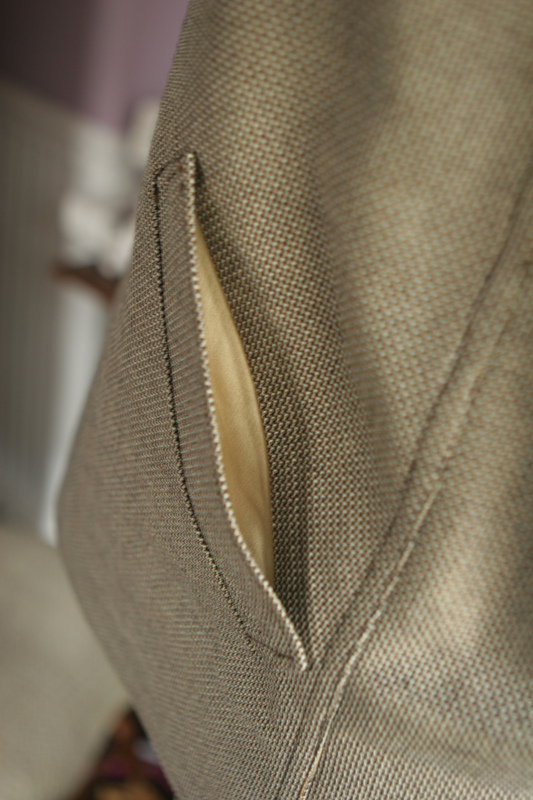 There is no small amount of tailoring involved in this project. The welt pockets are a nice touch. 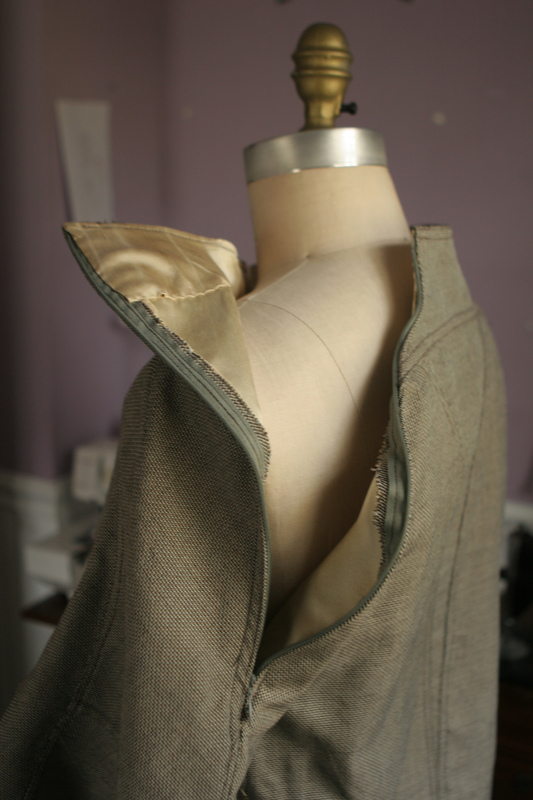 All of the seams are flat felled (does that count as tailoring?) 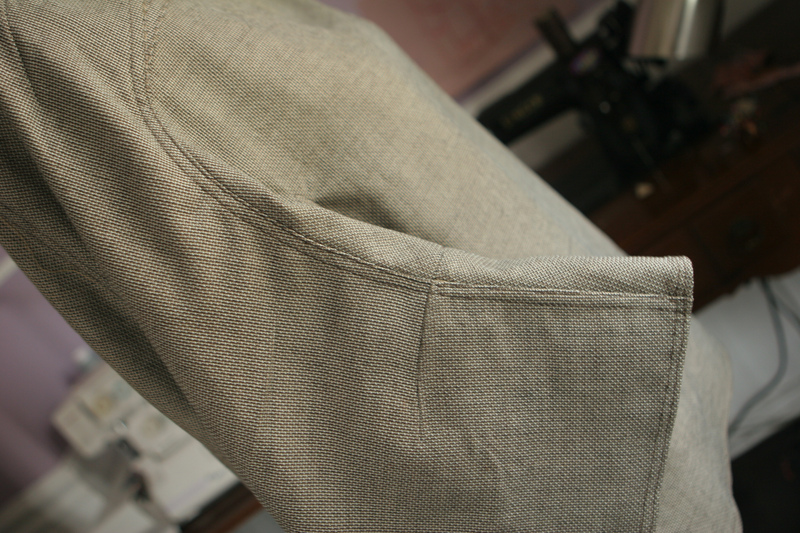 The shoulder and sleeve seams are devilishly complicated. It’s a meaty project for those looking for a challenge. 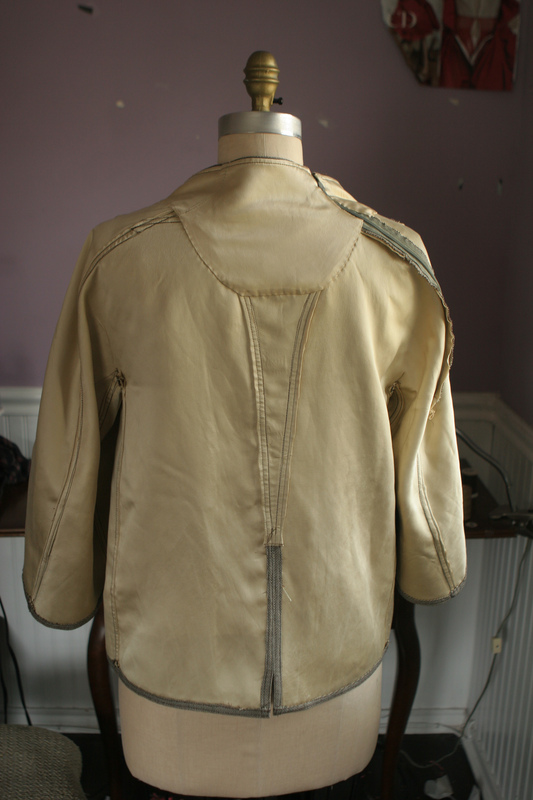 inside-out view, showing silk charmeuse underlining. This entry was written by Claudine, posted on April 24, 2013 at 1:06 am, filed under Tailoring and tagged Vogue 1115. Bookmark the permalink. Follow any comments here with the RSS feed for this post. Post a comment or leave a trackback: Trackback URL. What a lot of labor and learning curve! I was impressed enough and then you showed the lining photo! 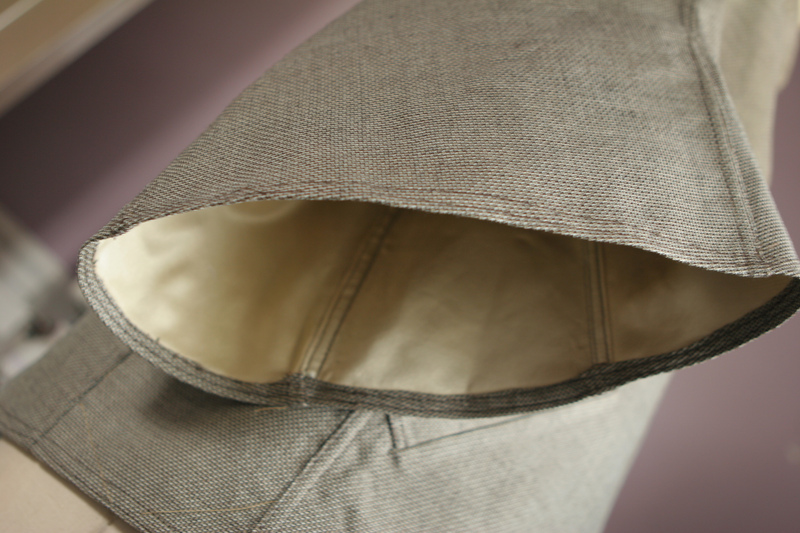 WOW…but with all this fancy footwork and stitching…how does it look on you? Is is comfortable and flattering? Would you make it again in another fabric? 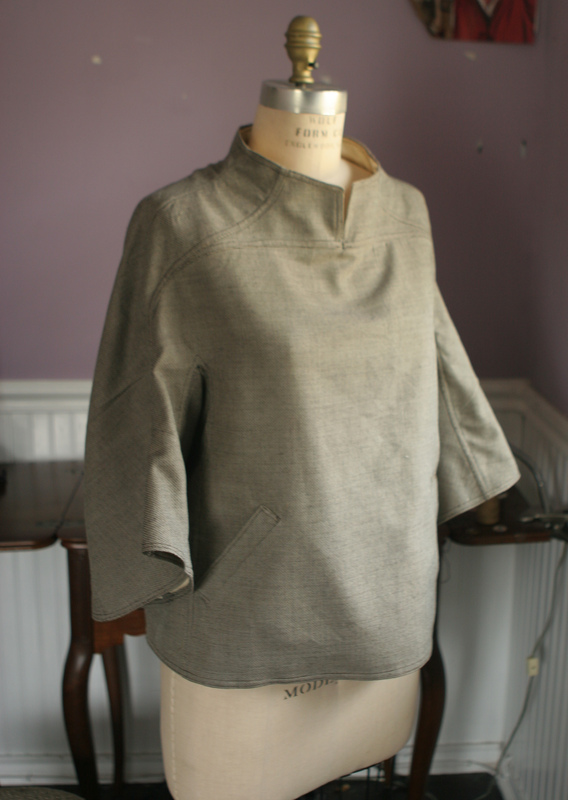 It looks a little loose-fitting but should look amazing with all those details. Thank you! It is probably not the most flattering garment, but that’s OK with me. I have only worn it for short periods of time, but I am planning on wearing it on a plane tomorrow. We’ll see how comfortable it is. Very impressive! It must have been fiddly working with the slippery underlining with all those seams. 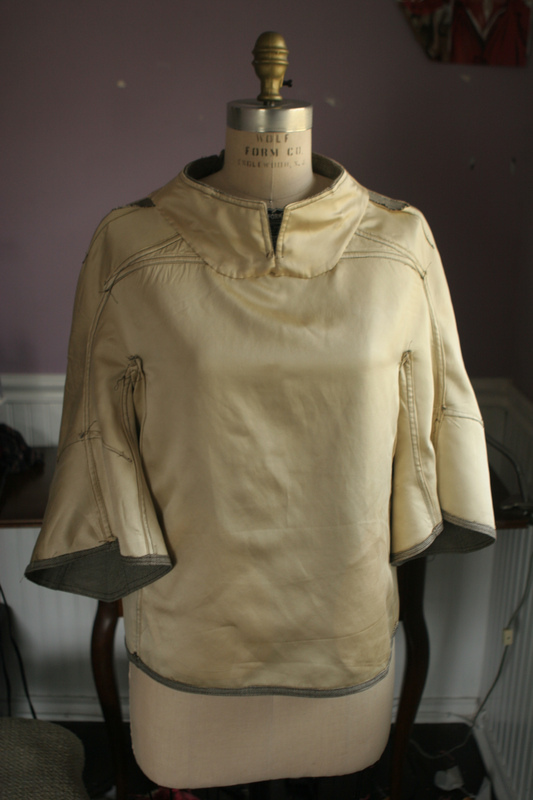 We probably will go from winter to summer this year~ It’s gorgeously made Claudine. I love all the details. It looks very beautiful. Good job! Claudine, I really like this sculptural look. Very very nice. I am off to look at the pattern. BTW definitely yes to visiting! We should (fingers crossed) even have a guest house by then. I adore this. This is so beautiful!! This is such a cool top! Love the fabric choice and the zipper really adds to the uniqueness of the piece. Since I saw this pattern on Vogue’s website I have been looking for a review from someone who has actually made it and here it is! It looks great, even better than on the pattern cover picture. I can’t wait to try it now! How did you go with that darned little 2″ square remnant attached to the underarm? Number 3 of instructions. I am about to mke it for the second time and really can’t understand the isntructions. I see I am supposed to attach it to the outside of the underarm. Am I supposed to turn it to the inside of the underarm section? Here’s how I do it. 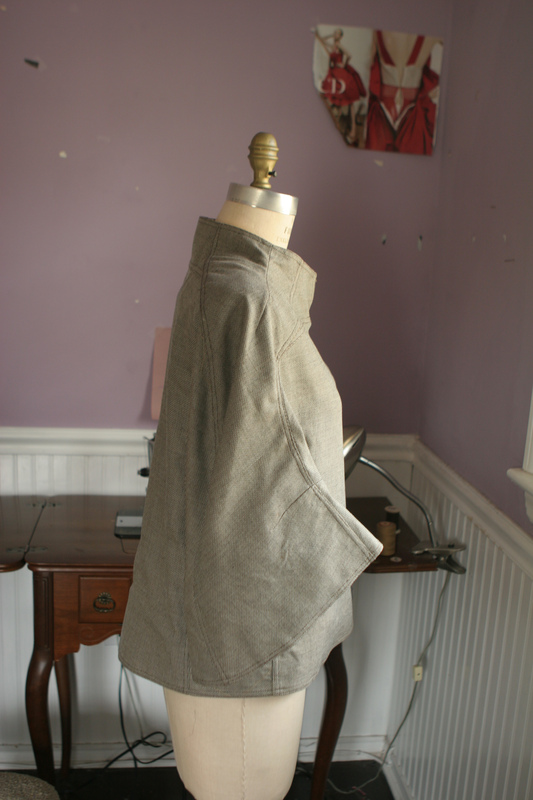 I start with a lining piece that’s much larger than 2″. Maybe a 6″ square. It’s impossible to place a 2″ square and not have it move. 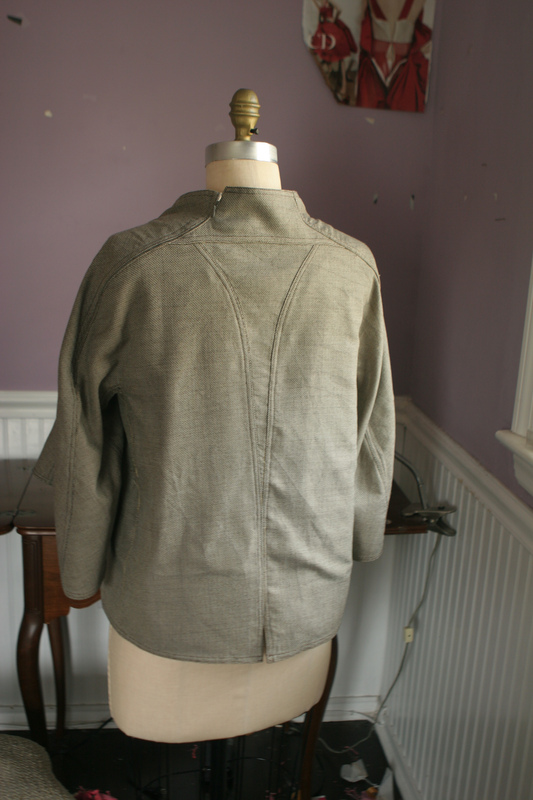 I pin my 6″ square to the right side of the garment piece. I mark the stitching line on the wrong side and stitch from the wrong side. I trim my piece to around 2″ square. Then I make a slash bisecting the 2 legs of the triangle represented by my stitching lines. I press the square toward the middle of the triangle, then flip the lining piece to the wrong side, flatten it, and press again. This is a pretty standard method of reinforcing corners. I’m sure someone has done a tutorial on it, with photos or maybe a video. Advice much appreciated, the pattern instructions could have been a bit more explicit. I am grateful to you for your advice. I do love this pattern. Also just wanted to say I’m so glad you did memademay. I love seeing your clothes on your actual person and really liked the split picture format of front and back. Thanks!